Today, in New York the World Monument Fund (WMF), the leading independent organization devoted to saving important cultural heritage sites around the world. since 1965, has listed Sirius on their 2018 Watch List. Every two years since 1996, the World Monuments Watch issues a call to action for treasured cultural heritage sites around the globe. This year, the WMF has called for the NSW Government to respect the recommendation of its heritage experts and list Sirius on the NSW Heritage Register. Sirius has been added to the 2018 World Monuments Watch List, which includes only 25 sites representing a wide variety of challenges ranging from human conflict and urbanization to natural disaster and climate change. Shaun Carter, Save Our Sirius Chairperson said “Today’s announcement by the World Monuments Fund to place Sirius on their watch list demonstrates the architectural and social significance of Sirius. “We agree, the NSW Government should listen to the expert advice of their own heritage council, and list Sirius on the NSW Heritage List. The NSW Heritage Council recognised Sirius as exemplar Brutalist Housing, and acknowledged the buildings link to the Green Bans movement. “We need to protect our recent architectural history so that future generations can appreciate and follow the stories of Sydney. “The Save Our Sirius Foundation continues to celebrate Sirius and its residents, with the publishing of a new book Sirius to be launched by Lord Mayor Clover Moore on 8th November. 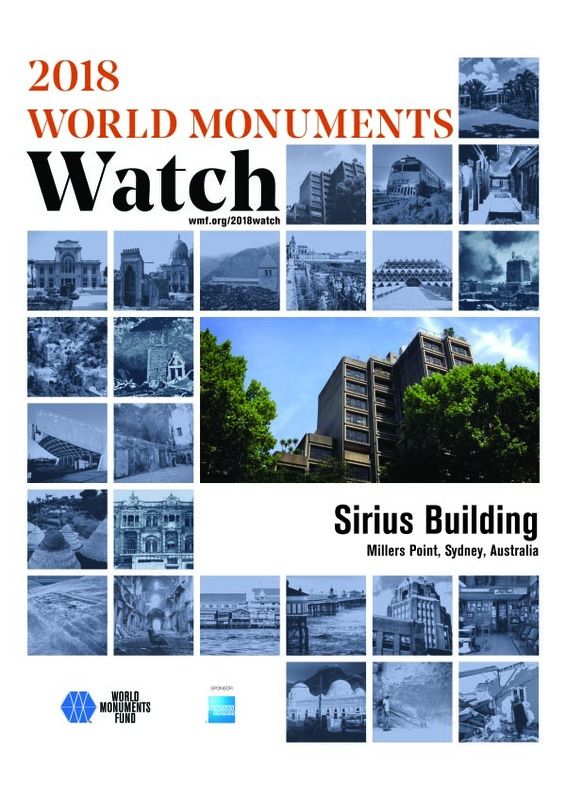 Sirius has been included on The Worlds Monuments Watch List – one of only 25 sites worldwide. The 2018 World Monuments Watch calls on the government of New South Wales to respect the recommendation of its heritage experts and allow its citizens to maintain an important social legacy. Myra will soon be the last person living in Sirius. In February 2016, the Heritage Council of New South Wales issued a unanimous recommendation for the listing of the Sirius Building, for its architectural and cultural significance. In July 2016, the Minister of Environment and Heritage rejected the recommendation, on the grounds that protective designation would diminish the building’s expected sale price, constituting undue financial hardship for the government. In July 2017, the Land and Environment Court of New South Wales invalidated this rationale and ordered the state government to repeat the decision-making process. Currently, the Government is reserving their right to appeal the decision. Glenn Harper is a recipient of the 2015 Byera Hadley Travelling Scholarship for his project, The Sydney Brutalist Project, and author of the Instagram feed Brutalist_Project_Sydney. He is an architect and urban designer, an independent researcher and a long-time member of the Australian Institute of Architects’ NSW Heritage Committee. He is currently a Senior Associate and Urban Design Lead at PTW Architects. A Brutalist icon, the Sirius Building was the product of environmental and social activism that left its mark on Sydney during the 1970s. Redevelopment of The Rocks, an adjacent harbour front neighbourhood, was threatening to displace long-time residents. In response to community protests and the celebrated “Green Bans” movement, the Sirius Building was built in Millers Point, as public housing for local community members. It has since become an iconic sight along the approach to the Sydney Harbour Bridge, with a rising, pyramidal composition of stacked concrete boxes topped by rooftop gardens. The building was designed by architect Tao Gofers for the New South Wales Housing Commission and contained 79 units, some enjoying unobstructed views of the harbour and the Sydney Opera House. Millers Point, one of Sydney’s oldest neighbourhood’s, was once the city’s maritime centre. In the early twentieth century, it came under the control of the state of New South Wales, and has since then contained public housing, including Australia’s first. But as Sydney has grown into a global metropolis, Millers Point itself is now prime real estate. In 2014, the state government of New South Wales announced that it would sell hundreds of public housing properties in Millers Point and The Rocks, expecting to receive A$500 million, to be used for the construction of new public housing elsewhere. This was the latest among many sell-offs of government-owned properties during the previous decade. In preparation for the sale of the building, most of its residents were relocated, and only two residents now remain. Visit wmf.org/2018watch to learn more. World Monuments Fund is the leading independent organization devoted to saving important cultural heritage sites around the world. It was founded in 1965. Every two years (since 1996), the World Monuments Watch becomes a call to action for cultural heritage around the globe that is at risk from the forces of nature and the impact of social, political, and economic change. The Watch is World Monuments Fund’s primary advocacy program. It brings international attention to the challenges facing cultural heritage sites and their communities around the globe. Inclusion on the Watch provides nominators and site owners with an important opportunity to promote sites locally and internationally, to work towards improved site protection, and to build community engagement in their preservation efforts. The 2018 World Monuments Watch includes 25 sites in more than 30 countries and territories. American Express is the founding sponsor of the World Monuments Watch. This entry was posted in heritage, Press Release. Bookmark the permalink.